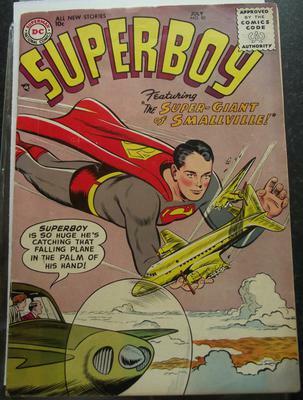 Superboy no 50 Good condition. Editor's reply: Thanks for sending in this comic for appraisal. Superboy comics are not very popular, unfortunately. Apart from a couple of key issues, such as the first appearance of the Legion of Super-Heroes, Superboy comics are lagging behind other DC titles. We'd need a good Superboy movie to really see some movement, but don't hold your breath! And so, back to your comic. The record for this is only $388. That was for a CGC 8.0 copy, and given that only eight have been graded so far, it would take a very high-grade copy to get near that. Unfortunately yours is not that nice. To me it looks around a 6.5 or so. Nice copy but not sharp enough to be really exciting. I'd price this ungraded copy at around $60-$70. Let me know if it's for sale, and thanks again for writing in.